Amy-Joyce Hastings and Mark Killeen at the world premiere of The Callback Queen at the 25th Galway Film Fleadh. Killeen, Amy-Joyce Hastings and Graham Cantwell at the world premiere of The Callback Queen at the 25th Galway Film Fleadh. 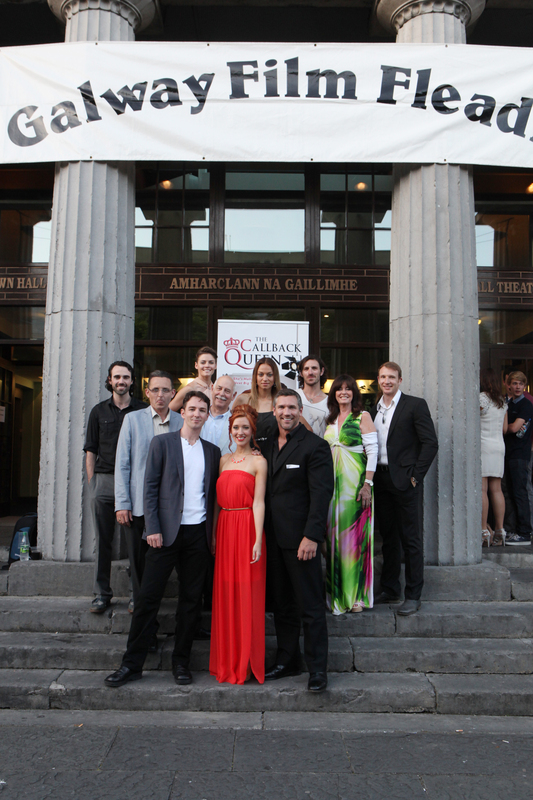 The cast and crew of The Callback Queen at the world premiere at the 25th Galway Film Fleadh. Oughterard born actress Amy-Joyce Hastings is riding high at the moment, having just come from the world premiere at the Galway Film Fleadh of The Callback Queen, a romantic comedy directed by Graham Cantwell set in the London film industry in which Amy-Joyce plays the title role of Kate Loughlin opposite a number of big names including Ger Ryan (Intermission, The Commitments), Mark Killeen (Game of Thrones, 300:Rise of an Empire) and Vicki Michelle (‘Allo ‘Allo). Amy-Joyce’s directorial debut was also screened at the Fleadh, Nocturne Passage, a short psychological horror starring the IFTA award-winning actress Susan Loughnane, best known for her role in Love/Hate. Nocturne Passage centres on a young artist’s fight to hold on to her sanity in the wake of devastating events. A character study and a psychological horror, the film takes place over one day and also features flashback sequences. “The Galway Film Fleadh is one of my favourite festivals on the calendar and I love getting to spend a bit of time in Oughterard, meeting friends and family during the week of the festival”, says Amy-Joyce, “I always try to stay for a few days afterwards to recharge my batteries. The pace of life in London can be quite taxing, so it is a blessing to spend a bit of quality time on Lough Corrib, particularly when the weather is so beautiful”. Amy-Joyce’s grandparents Dr. Kevin Glynn and wife Mary-Rose (née Joyce) will be familiar names to many, and recently Amy-Joyce got the chance to work with world renowned photographer John Carlos on a photo shoot in Gortdrishagh, the family home where she spent most of her youth. “It is such a special place for me, it was wonderful to spend a bit of time in and around a place where I have so many fond memories”, she says, “Working with John Carlos was especially fulfilling, as he is even more of a perfectionist than I am”! Amy-Joyce is currently performing the role of Miranda in Wexford’s Travelling Light Theatre Company’s production of Shakespeare’s The Tempest. The Callback Queen will be touring the worldwide festival circuit before a nationwide release later in the year.